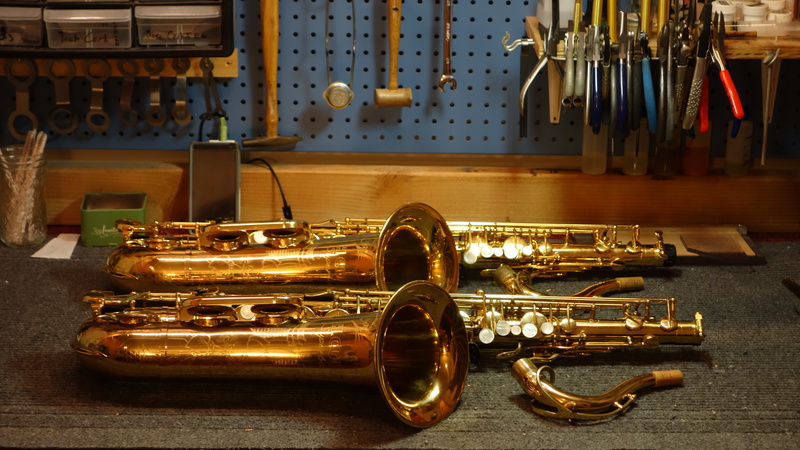 Pictured above are two Couf Superba I tenor saxophones. They are within 2000 serials of each other, are both in very good original condition with fully intact original finishes, and have both been overhauled by me at the request of their owners to have exactly the same setup- same pads, same resonators, exact same key heights, overhauled by the same repairman- and unlike most new horns, they are demonstrably leak-free. The only difference is that the one in the foreground is lacquer, and the one in the background is gold plate- both original. In other words, this is one of the few times that the most basic requirements for comparison between different finishes is met. So of course, I A/B’d them. I switched back and forth multiple times (using the same setup of course) and I had my wife (who has a very good ear, and whom I have used for feedback about sound qualities for years) give me a second opinion. The result? Nada. I mean they were different saxophones, but the difference was miniscule, and not one that couldn’t be attributed to just being different horns built on different days. And the difference was nothing that made one better than the other, and the difference was so subtle I am not convinced there really WAS a difference. While I do believe that the material the saxophone is made of makes a difference, I am not convinced that the finish of the instrument- all other things being equal, which is a tall (nearly impossible) order- makes much of a difference. I think people tend to attribute sonic differences to the most visible component, which is overly simplistic. If we could understand the bore of the instrument as well and as instinctively as we can tell the difference between lacquer and silver plate, the conversation would be different- and more useful.